Property Location When you stay at Inns on Bellevue in Newport, you&apos;ll be near the airport and minutes from Redwood Library and Athenauem and Touro Synagogue. 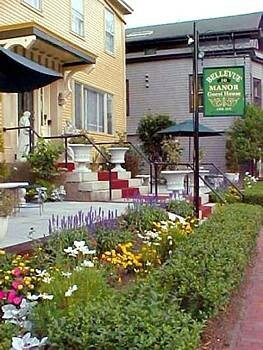 This hotel is within close proximity of Newport Art Museum and Old Stone Mill.Rooms Make yourself at home in one of the 53 air-conditioned rooms featuring flat-screen televisions. Complimentary wireless Internet access keeps you connected, and cable programming is available for your entertainment. Conveniences include irons/ironing boards, and cribs/infant beds (complimentary) can be requested.Rec, Spa, Premium Amenities Make use of convenient amenities, which include complimentary wireless Internet access and discounted use of a nearby fitness facility.Dining A complimentary continental breakfast is included.Business, Other Amenities The front desk is staffed during limited hours. Free self parking is available onsite.